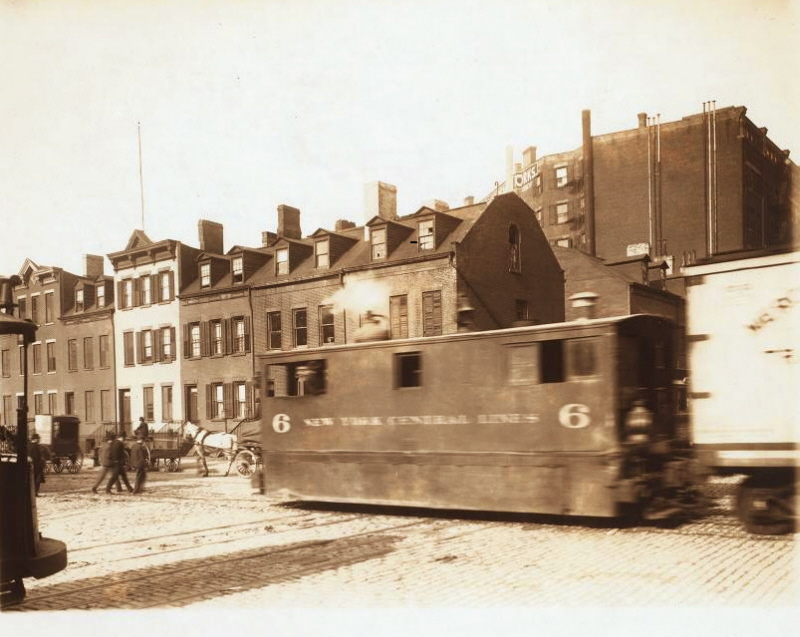 This page, for the most part, is an album of images pertaining to freight operations in Brooklyn, Queens, Staten Island, Bronx, and Manhattan. Where possible, I have tried to provide locomotive data. The first section, is a compilation of historical images I have encountered while researching the topics and locations on my website. The second section are images that I took of modern era operations that now occupy the sites of the former railroads and operations that I research. 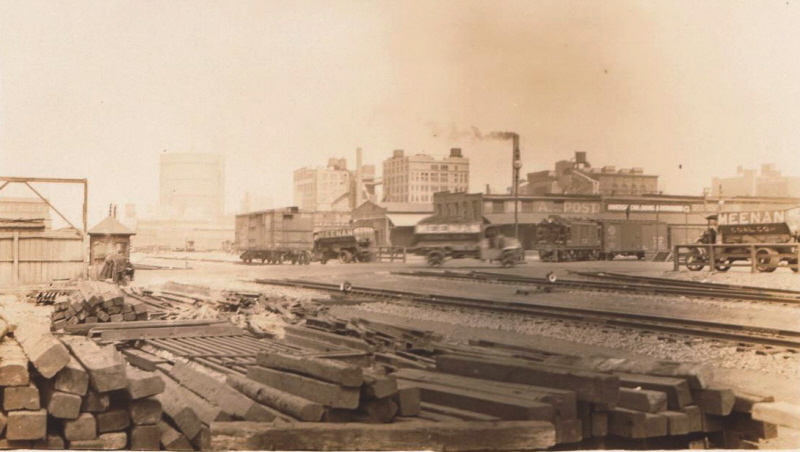 (looking northeast at 188, 190, 192 Hudson Street. 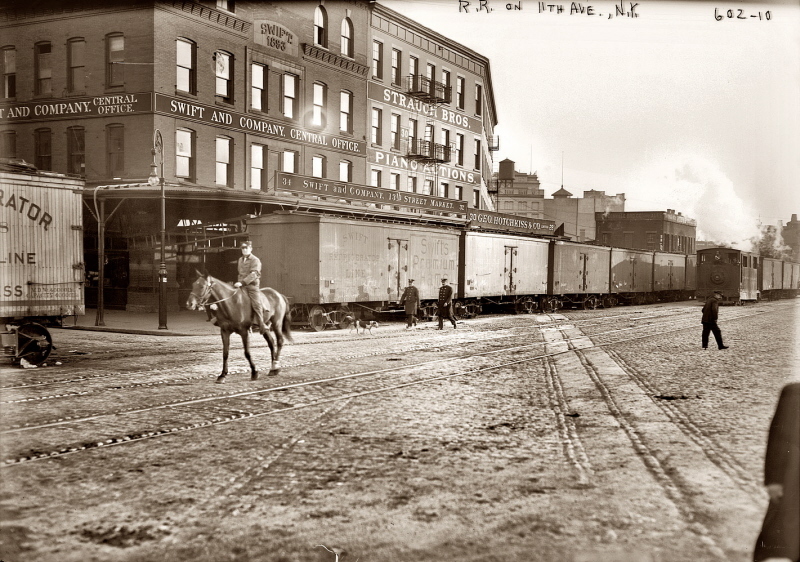 train is heading (pushing) towards New York Central & Hudson River Freight Depot one block right (south). 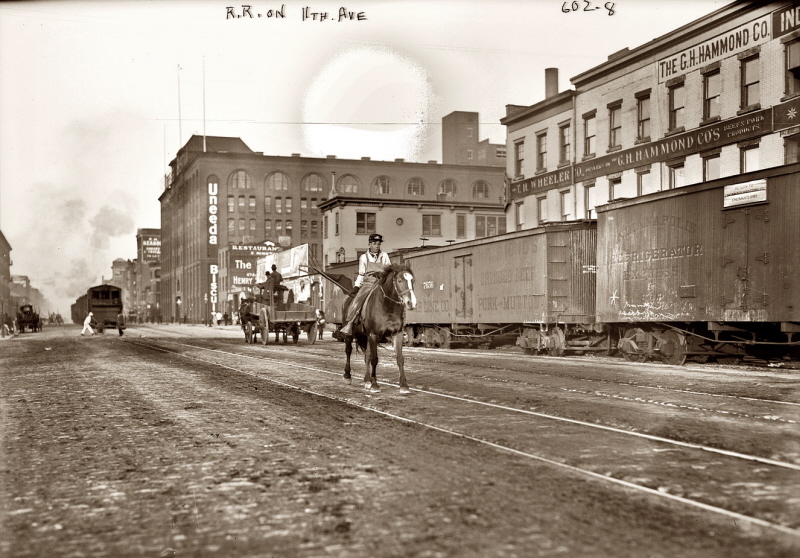 Man on horse is a NYCRR Watchman / RR Policeman a/k/a "West Side Cowboy" escorting the locomotive as required by NY City law. 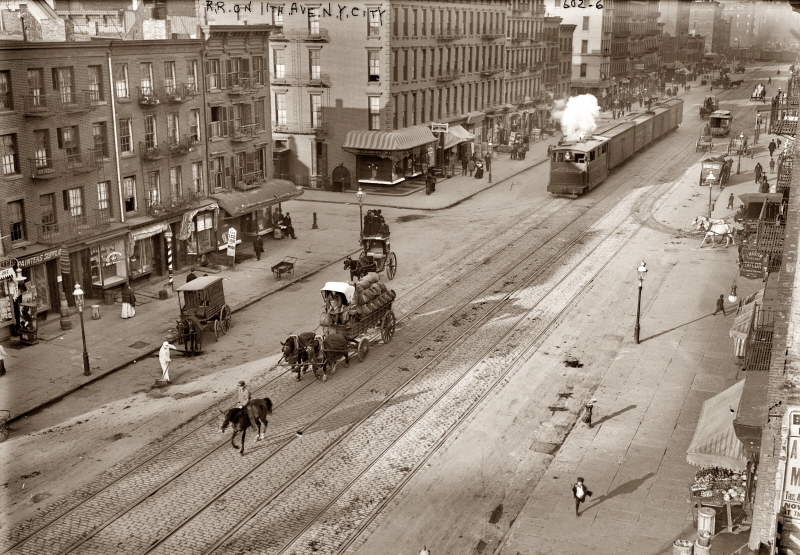 * According to Tim Zukas, this is Tenth Avenue, not Eleventh Avenue. Why the discrepancy in negative marking? 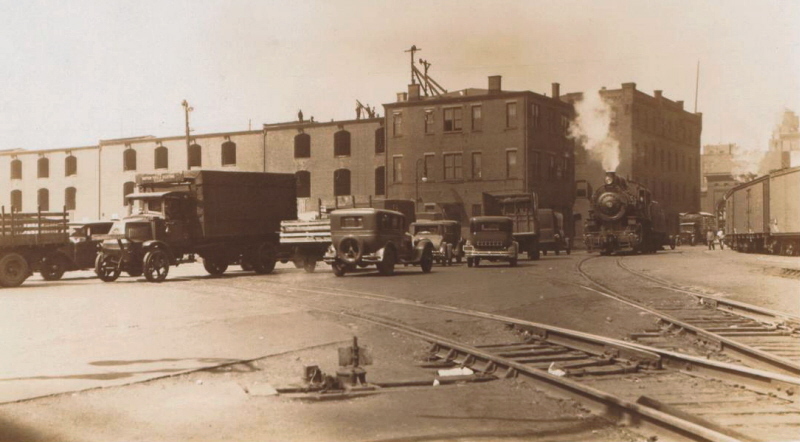 Unfortunately, this images location has been mis-attributed (including here) to the Hell Gate Yard to the east. 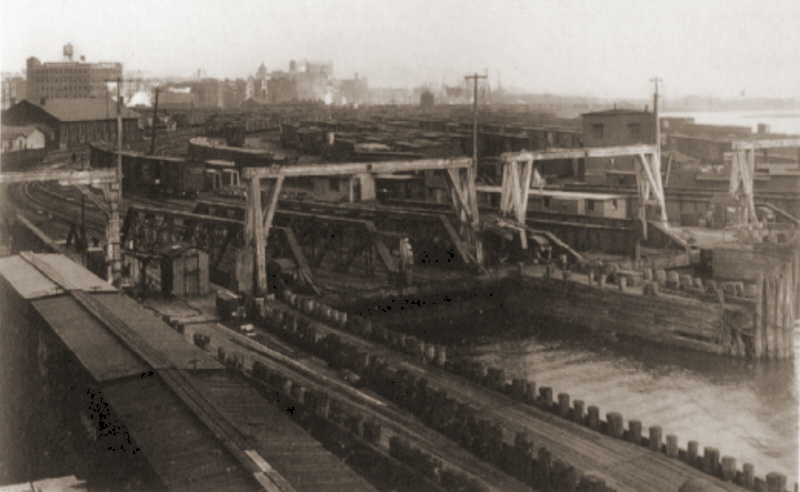 The Hell Gate Yard did not have float bridges. It was located at Stoney Point, east of the Hell Gate Bridge abutments. 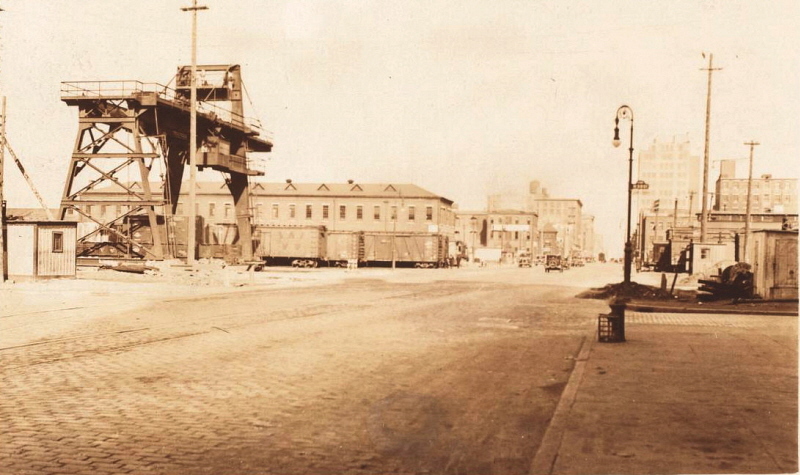 The Harlem River Yard did have float bridges, and was located west of the Hell Gate Bridge at the confluence of the Bronx Kill and Harlem River. Also, the stone abutment of the Willis Avenue swingbridge can be seen on the extreme left edge. The following map section is taken from a New York, New Haven & Hartford Railroad Lighterage Map issued ca. 1918:. The tip of the pencil is pointing at the locatrion of the float brdiges in the image above. "I am a son of Joseph V. Gallagher, one of the four Gallagher brothers that ran the company from the early twenties to sometime in the thirties. 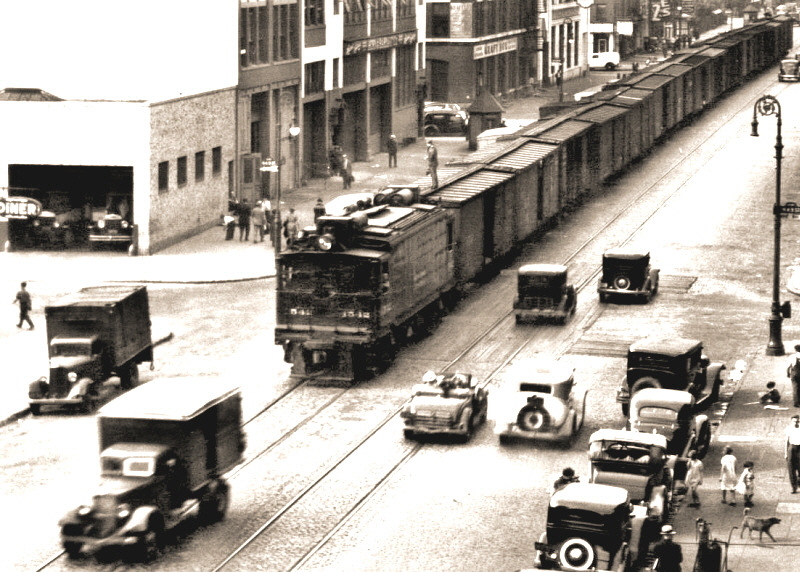 Your question about the company operating in either Jersey or LI City would be no, expect that the company was sold to Colonial Concrete, headquartered in Jersey, sometime in the thirties. 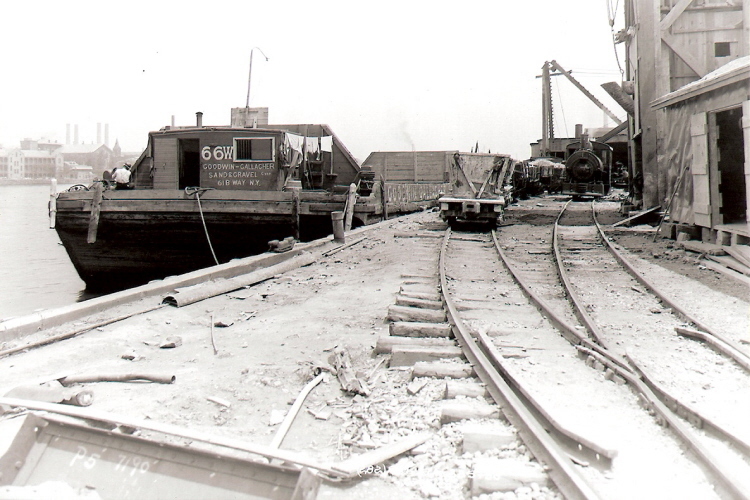 The photos of scows were mostly likely taken at the terminals of customers where sand was delivered." The structures across the river and to the left of the barge are the "Alm's Houses" located on Welfare Island (now known as Roosevelt Island and formerly Blackwell's Island). 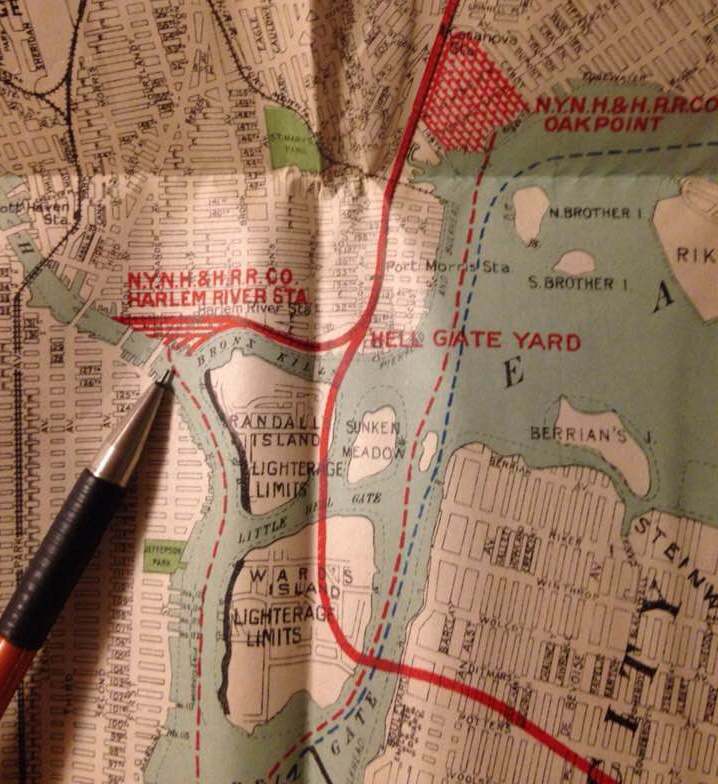 Many thanks to Judith Berdy of the Roosevelt Island Historical Society for identifying those structures for me! 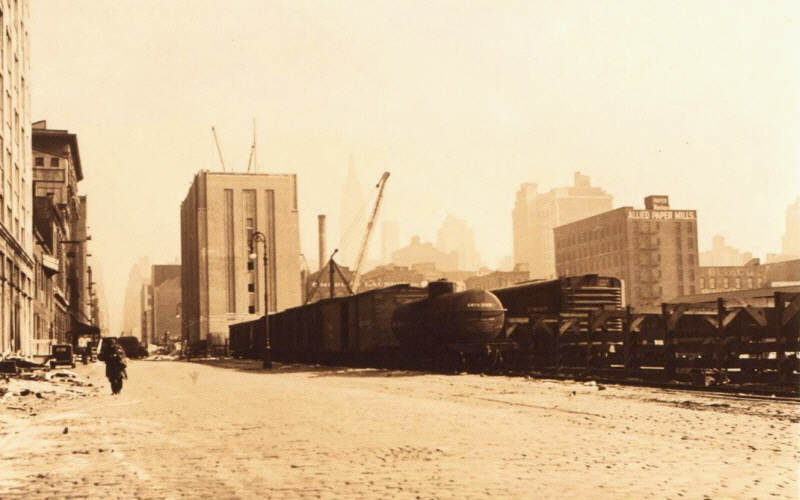 The steepled structure to the right of the Alm's Houses is the Chapel of the Good Shepard and the four smokestacks behind that is the Manhattan Power Plant located at York Avenue and East 75th Street. 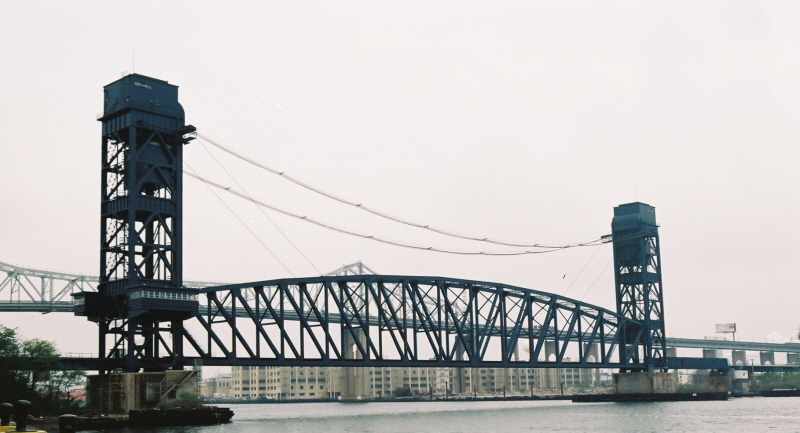 If this is indeed the case, and by rough triangulation of the field of view, then it is believed that Goodwin - Gallagher had their bulkhead location immediately north of the Queensboro (59th Street) Bridge. (That being ascertained by the photographer being in LIC, and on the east shore of the East River on the right and Blackwells Island on the left or west). 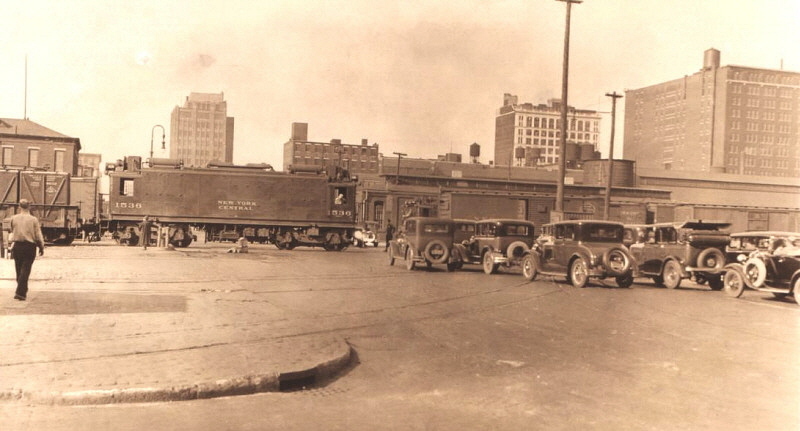 Also, Ms. Berdy recalled images in her research of a sand dealer just north of the Queensboro Bridge, where the current Queensbridge Park is located. 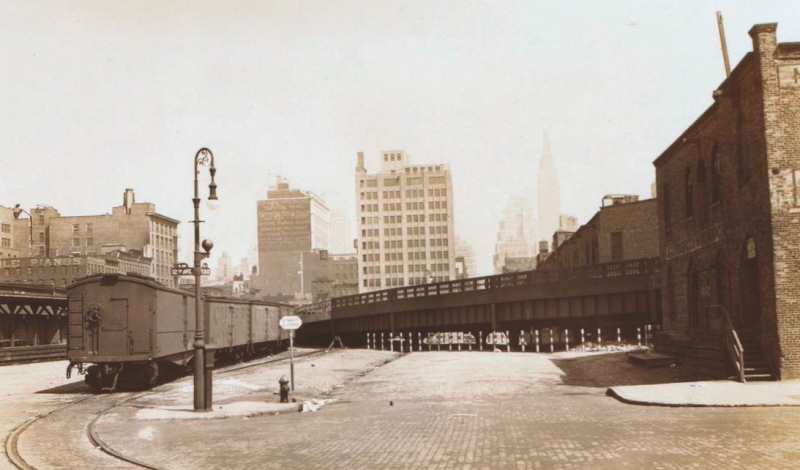 She also goes on to state, there was extensive excavation work in the same vicinity for the 59th Street Subway tunnels (current "N" & "R" train). However, other images reviewed of the actual Contract 61 (N & R line) excavation work, show towering steel cranes on a turntable, that go down into very large (at least 40' x 40') vertical shafts excavated into the ground where the excavated material was unloaded into dump cars. The image above fails to show this type of vertical shaft and crane, and instead shows a silo type structure with dump chute. It is this structure that leads the author to believe this was a aggregate dealer not a construction/excavation site. and not for reproduction or use without my express consent. Please contact me at bedt14@aol.com for consent. 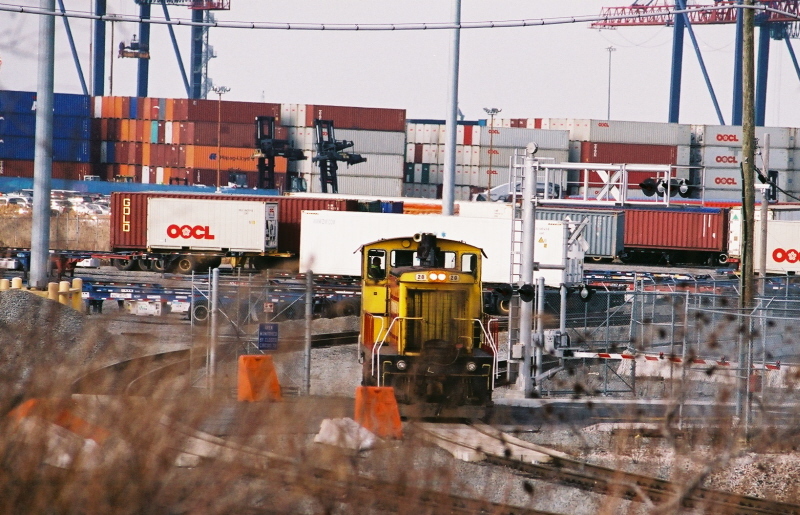 General photography / videography is prohibited at the New York Container Terminal facility. to photograph the locomotive operations. If you do not have permission, you will be stopped and detained - security is tight! 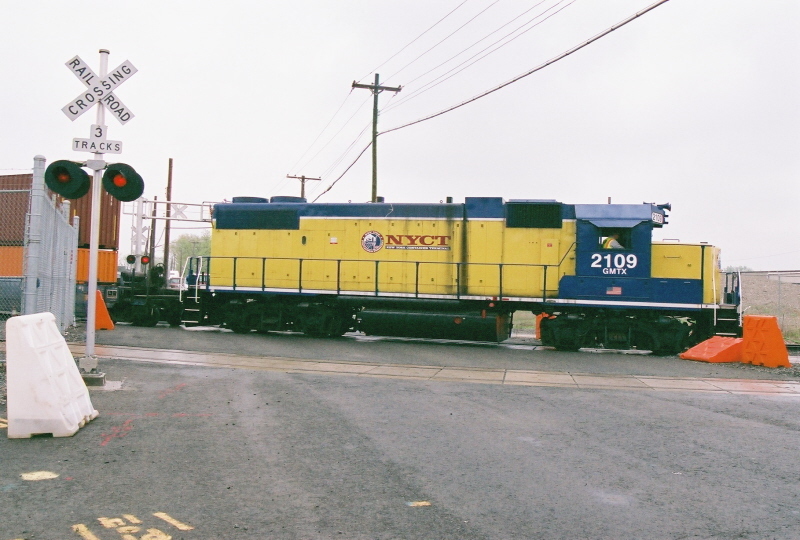 NYCT locomotive #2109 (GP38-2) was temporarily out of service with a cracked gear pan. 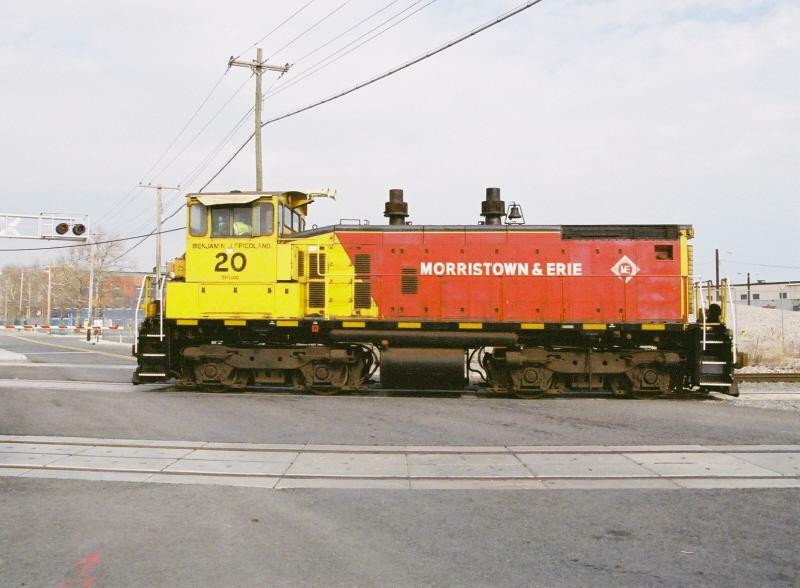 NYCT leased this locomotive from Morristown & Erie while NYCT #2109 was awaiting receipt of the new gear pan. 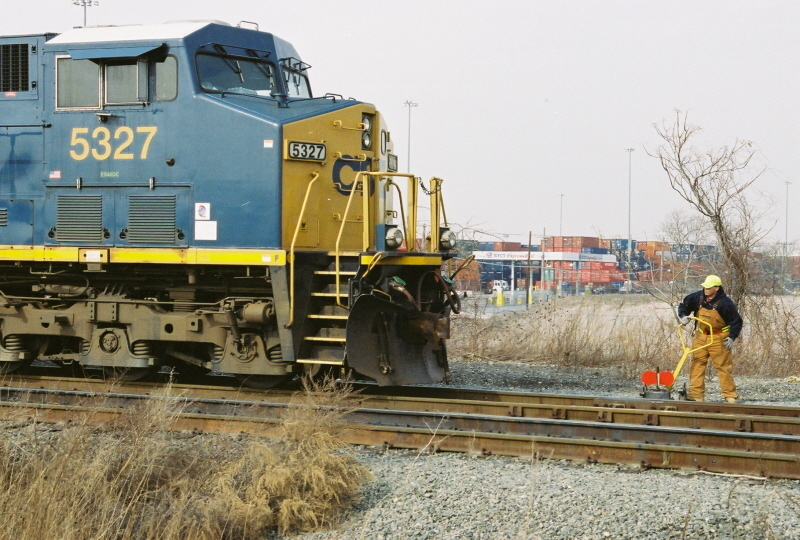 February 26, 2009 - CSX municipal waste container train PN-08 pulling into the AK Bridge approach from the Travis Branch Loop (west). the train pulls clear of the crossover in the Arlington Yard throat tracks. The train then reverses direction and backs the municipal waste containers down (east) into Arlington Yard. That's James the of the CSX train crew hitching a ride into the yard. 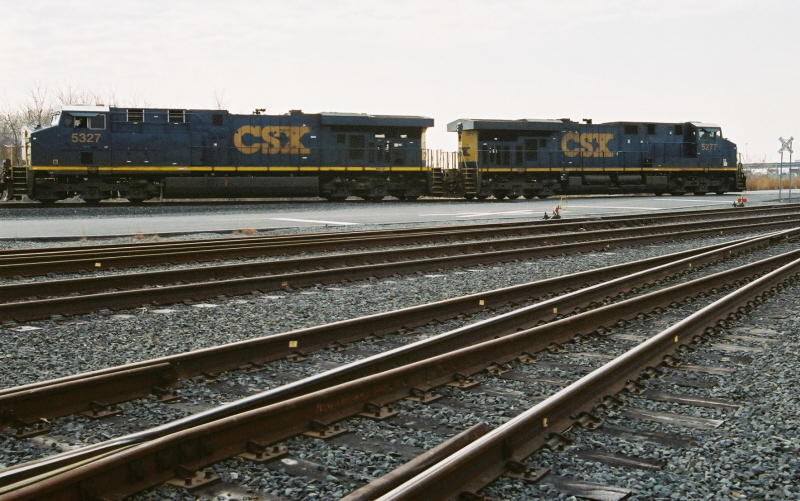 February 26, 2009 - The CSX locomotives on the Arlington Yard throat track crossover backing (east) into the yard. 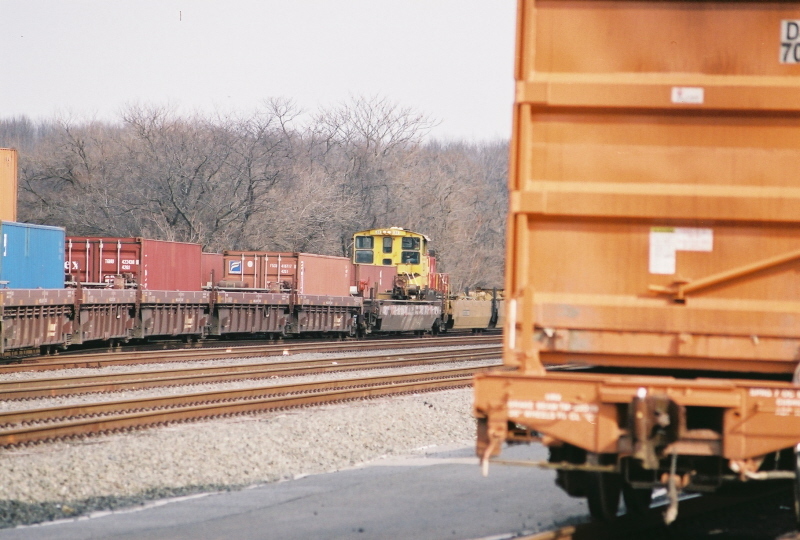 after the CSX crew dropped of the municipal waste cars, and pulled back forward (west). Now it will back down (east) on the intermodal container stack train to couple up. 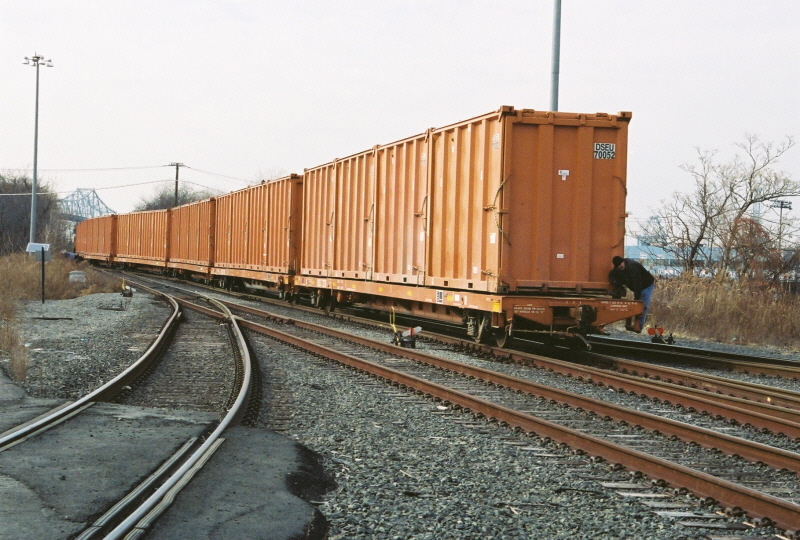 the NYCT crew is already bringing up more containers from the NYCT into the Arlington Yard. NYCT locomotive (leased M&E #20) moving back down the incline to the NYCT facility. 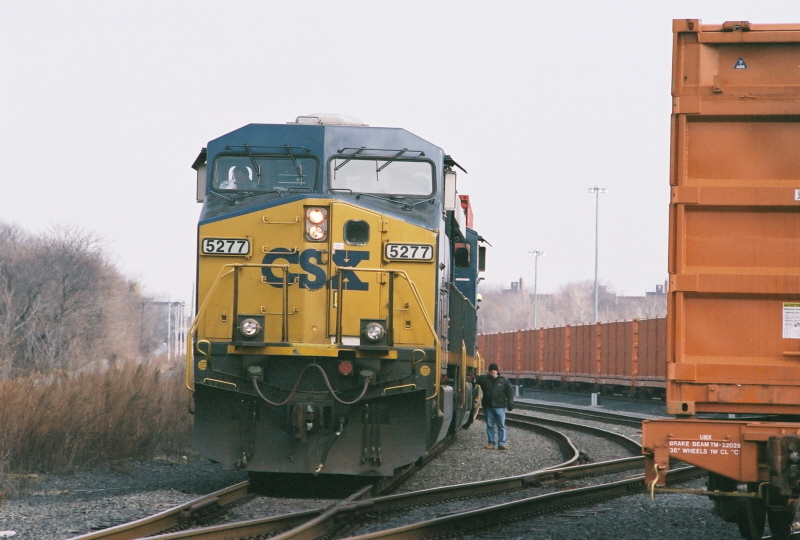 February 26, 2009 - CSX crew backing down (east) on the intermodal container stack train. clear of turnout, and back down on municipal waste containers with the intermodal container stacks. will wait for the AK (Arthur Kill) Bridge to drop, and will then proceed west to Cranston Junction, NJ. James (conductor / brakeman) on the ground. 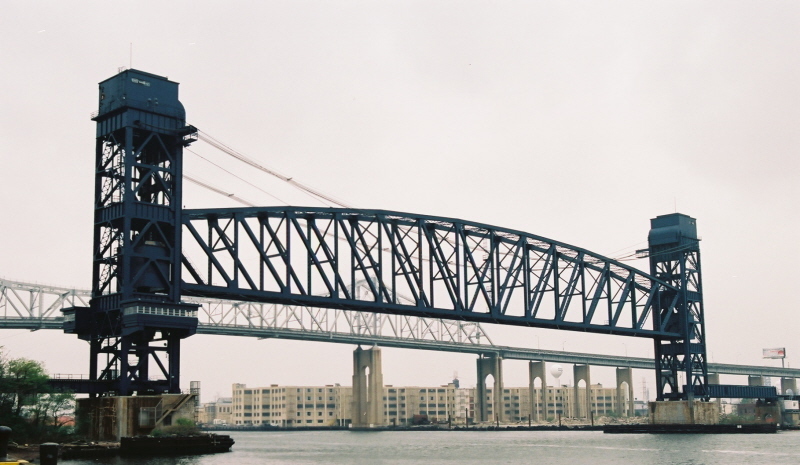 One of, if not my favorite railway bridge, is the Arthur Kill Vertical Lift Bridge " AK Bridge" connecting Cranston Junction, in Elizabeth, New Jersey; with Arlington Yard and the North Branch, Staten Island, NY. This bridge is the longest vertical lift bridge in the world, and was built by the Baltimore & Ohio Railroad. 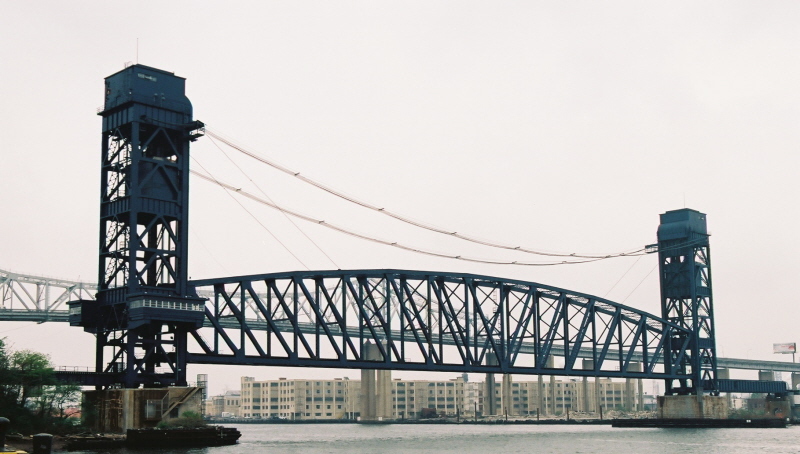 The Arthur Kill Vertical Lift Railroad Bridge was constructed in 1958 through 1959, and officially opened August 25, 1959 by the Baltimore and Ohio Railroad. 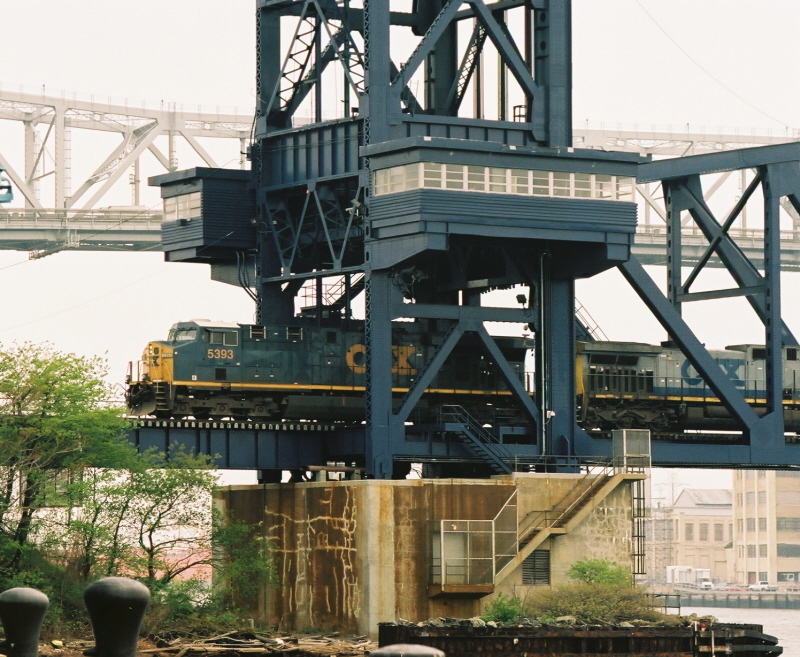 This vertical lift bridge replaced an older swing span that was damaged in a ship collision. This bridge is the largest vertical lift bridge in the world. The two towers are 215 feet in height. The movable span is 558 feet in length. In the lowered position the span is 31 feet above Mean High Water. 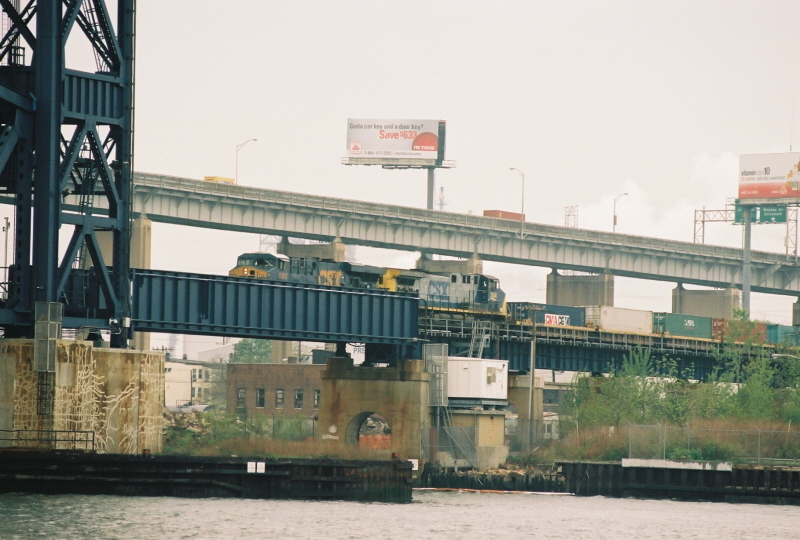 In 1991, it was taken out of service when the last freight train to use the North Branch (former Staten Island Rapid Transit) crossed it. 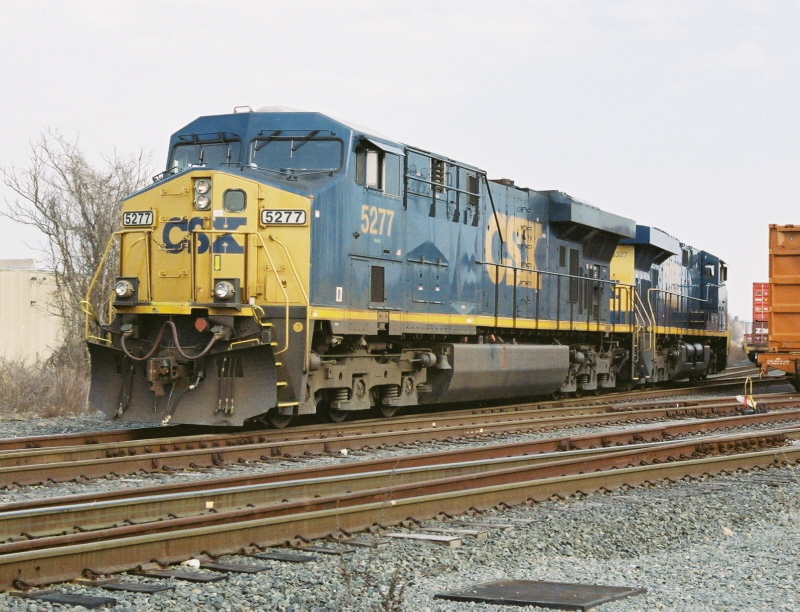 In 1994, the New York City Economic Development Corporation (NYCEDC) purchased the bridge and the North Shore branch of rail service from CSX. 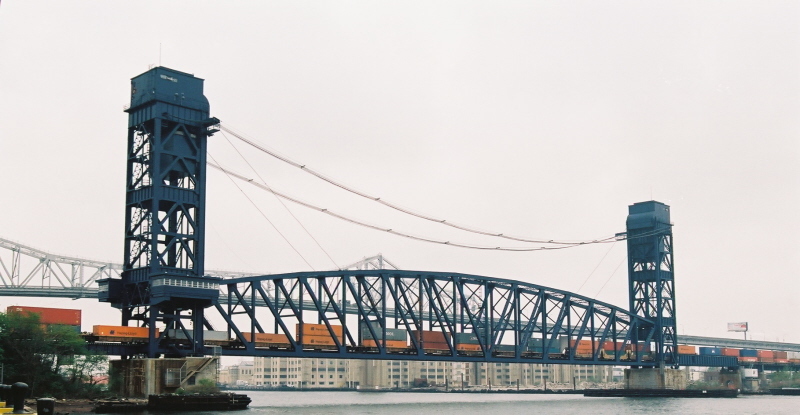 In 2004, NYCEDC and the Port Authority of New York and New Jersey (PANYNJ) announced plans to rehabilitate the bridge and reactivate freight rail service on Staten Island. Repairs to the bridge included repainting the steel and rehabilitating the lift mechanism. 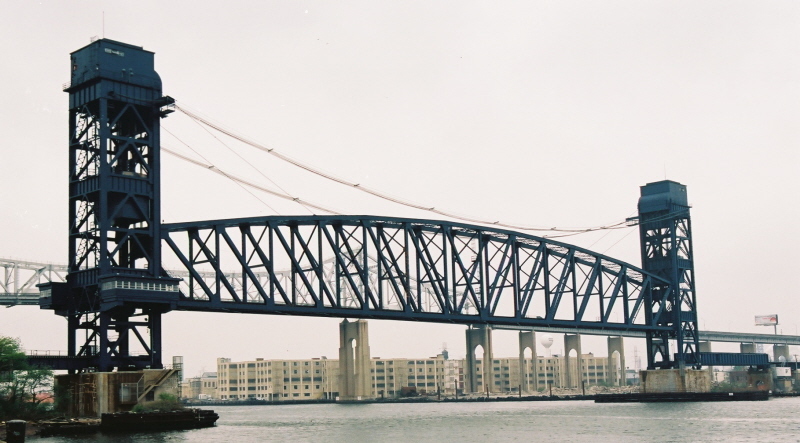 The bridge has been painted in "royal blue" in homage to the Baltimore & Ohio Railroad. The rehabilitation project was completed in June 2006. On October 4, 2006, a "train" crossed the bridge for the first time in 16 years. 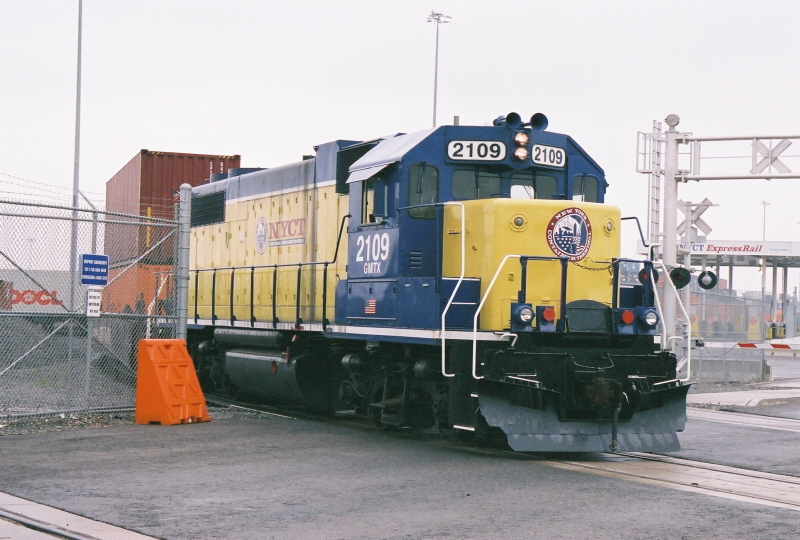 It consisted of just a single locomotive which took on switching duties at the New York Container Terminal. 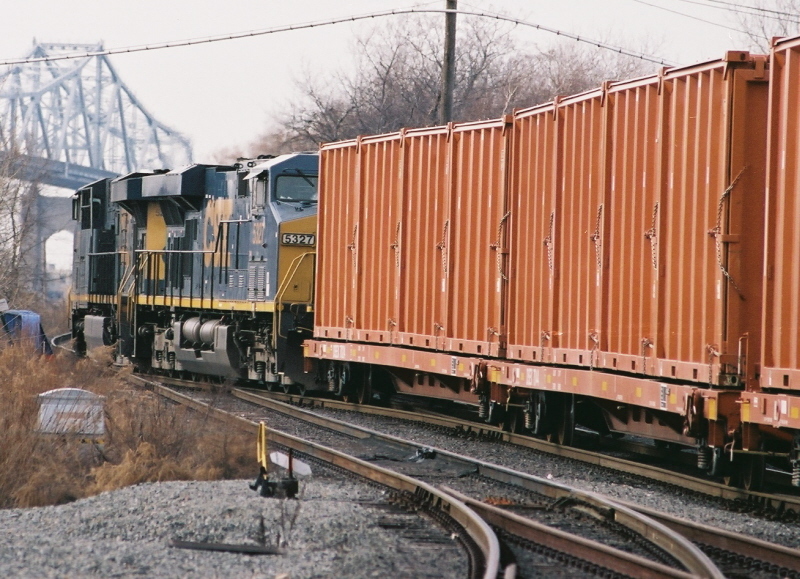 The bridge now sees regular service for both arriving and departing container stack trains for the New York Container Terminal, and trains of municipal waste departing Arlington Yard. 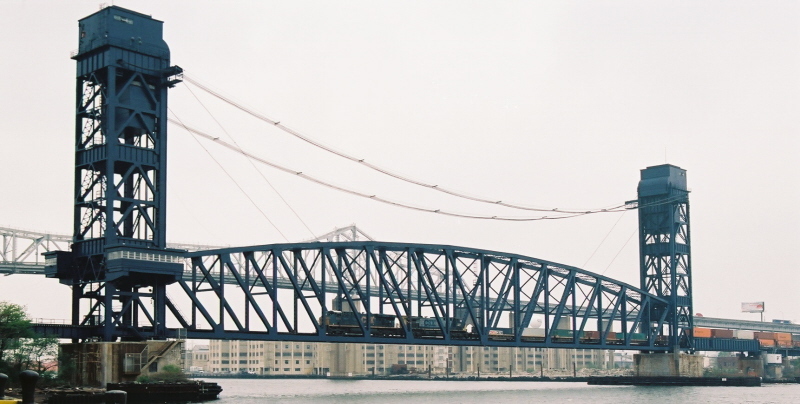 The bridge is kept in the up position to minimize marine navigation obstacle. It is usually lowered twice a day: one in the morning for inbound traffic, one in afternoon for outbound traffic. 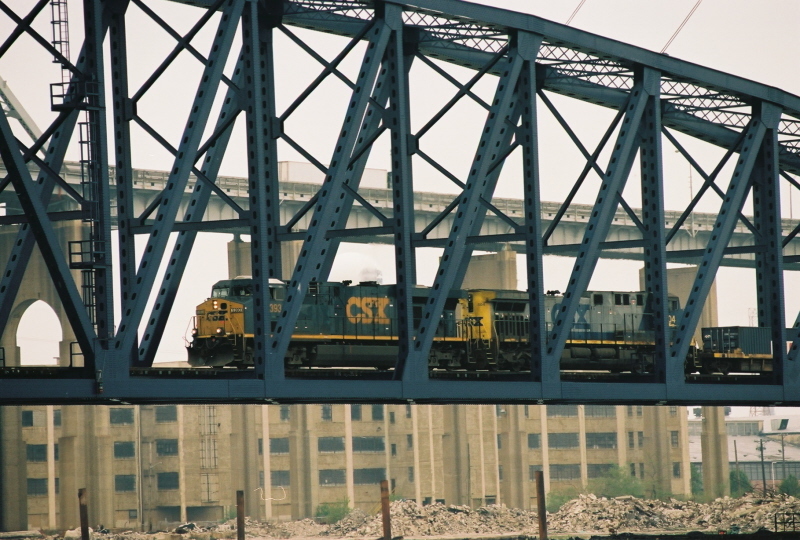 It used to appear that the bridge was lowered twice a week (Tuesdays and Thursdays), but increased rail traffic seems to warrant almost daily operation. 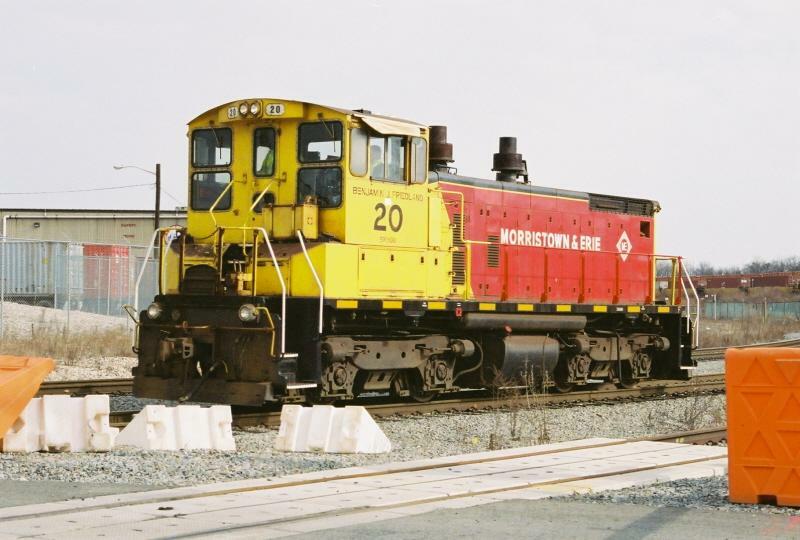 The Port Jersey Railroad is a small shortline, but don't let that fool you. 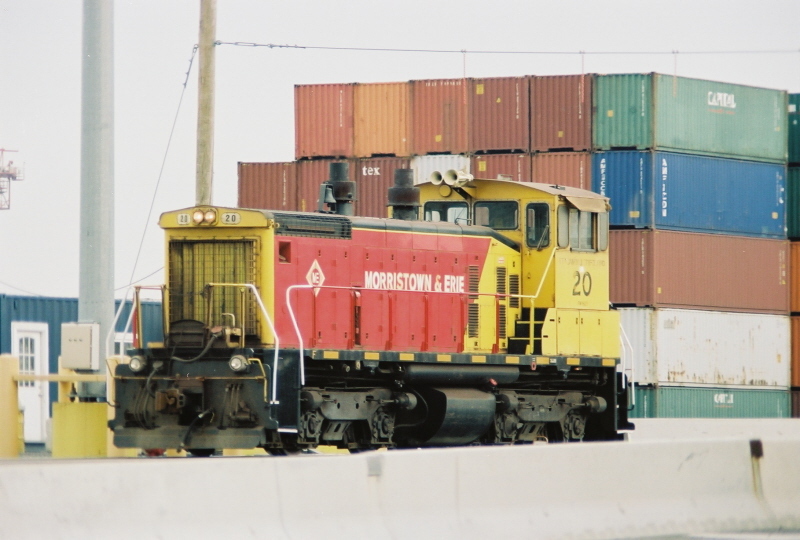 They move a substantial about of freight in Jersey City from various modes of shipping. 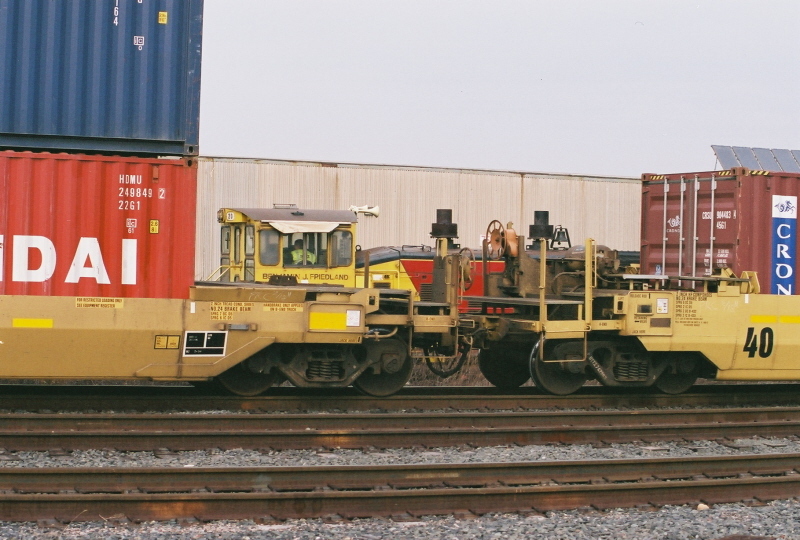 As of December 2010, New York New Jersey Rail purchased the Port Jersey Railroad. Information is now placed withing the Port Jersey RR chapter of New York New Jersey Rail.